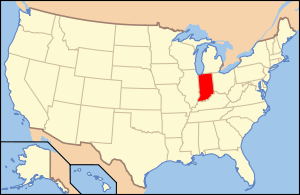 Adams County lies in northeastern Indiana in the United States and shares its eastern border with Ohio. It was officially established in 1836. The county seat is Decatur. According to the 2010 census, its population was 34,387, an increase of 2.27% from 33,625 in 2000. The county has four incorporated cities and towns with a total population of over 15,000, as well as many small unincorporated communities. The county is divided into 12 townships which provide local services. There are four Indiana state roads in the county, as well as three U.S. Routes and one railroad line. Adams County was created by statute on February 7, 1835, and organized March 1, 1836. Its name honors the sixth President of the United States, John Quincy Adams. The site of the county seat was chosen May 18, 1836. The first non-Native American settlers arrived in what is now Adams County in 1835. They arrived as a result of the end of the Black Hawk War as well as the completion of the Erie Canal. They consisted entirely of settlers from New England. These were "Yankee" settlers, that is to say they were descended from the English Puritans who settled New England in the colonial era. They were primarily members of the Congregational Church though due to the Second Great Awakening many of them had converted to Methodism and some had become Baptists before coming to what is now Adams County. The Congregational Church subsequently has gone through many divisions and some factions are now known as the Church of Christ and the United Church of Christ. When the New England settlers arrived in what is now Adams County there was nothing but a dense virgin forest and wild prairie. The New England settlers commissioned the first courthouse in 1839, it was a two-story frame building. The first jail was a log building that was completed in 1837. 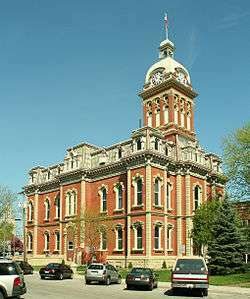 The present Adams County courthouse was built in Decatur in 1872–1873 at a cost of $78,979. [n 1] The designer was J. C. Johnson, who had been trained as a carpenter and joiner and became a self-taught architect; he won second place in the Indiana State Capitol design competition. The construction was done by Christian Boseker of Fort Wayne. It is built of red brick with stone ornamentation. Adams County superior court, Decatur, Indiana, 2006. According to the 2010 census, the county has a total area of 339.97 square miles (880.5 km2), of which 339.03 square miles (878.1 km2) (or 99.72%) is land and 0.94 square miles (2.4 km2) (or 0.28%) is water. 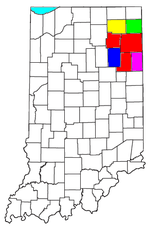 Adams County is bordered on the north by Allen County, on the west by Wells County, and on the south by Jay County. The two Ohio counties of Van Wert and Mercer lie to the northeast and southeast, respectively. The county has four incorporated settlements, all of which lie in a rough north–south line. The city of Decatur is the largest and is also the county seat, and is in the northern part of the county where U.S. Route 27 and U.S. Route 33 intersect with the east–west U.S. Route 224. U.S. Route 27 continues south through the town of Monroe, near the center of the county, and then on through Berne and Geneva. 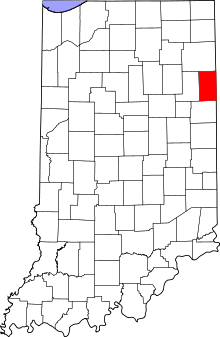 Adams County is in the humid continental climate region of the United States along with most of Indiana. Its Köppen climate classification is Dfa, meaning that it is cold, has no dry season, and has a hot summer. In recent years, average temperatures in Decatur have ranged from a low of 17 °F (−8 °C) in January to a high of 84 °F (29 °C) in July, although a record low of −24 °F (−31 °C) was recorded in January 1985 and a record high of 107 °F (42 °C) was recorded in July 1934. Average monthly precipitation ranged from 2.16 inches (55 mm) in February to 4.42 inches (112 mm) in June. Three U.S Routes cross the county. U.S. Route 27 and U.S. Route 33 enter the north end of the county from Fort Wayne in neighboring Allen County. 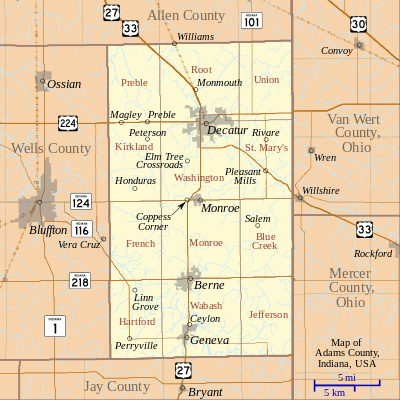 Passing through Decatur, they split; U.S. Route 27 goes south through Monroe, Berne and Geneva and continues into Jay County, whereas U.S. Route 33 heads southeast into Ohio. U.S. Route 224 passes from west to east through the north part of the county, intersecting U.S. Routes 27 and 33 in Decatur, then continuing into Ohio. Indiana State Road 124 cross the center of the county from west to east, passing from Bluffton in neighboring Wells County through Monroe and on to the Ohio border. Indiana State Road 101 is a north–south road that begins near the Ohio border at State Road 124; it runs north through Pleasant Mills and Rivare and continues into Allen County to the north. Indiana State Road 116 enters the county from Bluffton to the west, runs southwest and then south to Perryville, then runs east and terminates at U.S. Route 27 in Geneva. Indiana State Road 218 runs across the south part of the county from west to east and passes through Berne. CSX Transportation operates a rail line that runs from Decatur to the northwest toward Fort Wayne. 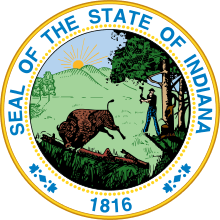 The county government is a constitutional body granted specific powers by the Constitution of Indiana and the Indiana Code. The county council is the legislative branch of the county government and controls all spending and revenue collection. Representatives are elected from county districts. The council members serve four-year terms and are responsible for setting salaries, the annual budget and special spending. The council also has limited authority to impose local taxes, in the form of an income and property tax that is subject to state level approval, excise taxes and service taxes. In 2010, the county budgeted approximately $2.2 million for the district's schools and $2.8 million for other county operations and services, for a total annual budget of approximately $5 million. The executive body of the county is made of a board of commissioners. The commissioners are elected county-wide, in staggered terms, and each serves a four-year term. One of the commissioners, typically the most senior, serves as president. The commissioners are charged with executing the acts legislated by the council, collecting revenue and managing day-to-day functions of the county government. Adams County is part of Indiana's 3rd congressional district; Indiana Senate district 19; and Indiana House of Representatives district 79. As of the 2010 United States Census, there were 34,387 people, 12,011 households, and 8,673 families residing in the county. The population density was 101.4 inhabitants per square mile (39.2/km2). There were 13,014 housing units at an average density of 38.4 per square mile (14.8/km2). The racial makeup of the county was 97.0% white, 0.3% black or African American, 0.2% Asian, 0.2% American Indian, 1.4% from other races, and 0.9% from two or more races. Those of Hispanic or Latino origin made up 4.1% of the population. In terms of ancestry, 42.9% were German, 8.2% were Irish, 7.9% were American, and 6.9% were English. Of the 12,011 households, 36.3% had children under the age of 18 living with them, 59.4% were married couples living together, 8.9% had a female householder with no husband present, 27.8% were non-families, and 24.6% of all households were made up of individuals. The average household size was 2.83 and the average family size was 3.41. The median age was 34.0 years. The median income for a household in the county was $47,697 and the median income for a family was $53,106. Males had a median income of $40,133 versus $29,907 for females. The per capita income for the county was $19,089. About 11.8% of families and 16.3% of the population were below the poverty line, including 26.9% of those under age 18 and 7.7% of those age 65 or over. Public schools in Adams County are administered by North Adams Community Schools, Adams Central Community Schools, and South Adams Schools. The Diocese of Fort Wayne and Lutheran Schools of Indiana both operate in Adams County as well. In all, these organizations operate 13 schools in the county. Author Gene Stratton-Porter lived in the southern part of the county in the early 1900s. Chemist Richard R. Schrock, 2005 Nobel Prize winner in organic chemistry, was born in Berne in 1945 and attended school in Decatur. Director David Anspaugh, who directed the movies Hoosiers and Rudy, was born in Decatur in 1946. Sculptor David Smith (March 9, 1906 - May 23, 1965) was born in Decatur. ↑ A $79,000 capital expense in 1872 would be roughly equivalent to $18,900,000 in 2010. ↑ "Find a County – Adams County, IN". National Association of Counties. Retrieved 2011-10-10. 1 2 "Adams County QuickFacts". United States Census Bureau. Retrieved 2011-09-17. 1 2 3 4 "DP-1 Profile of General Population and Housing Characteristics: 2010 Demographic Profile Data". United States Census Bureau. Retrieved 2015-07-10. ↑ "Adams". Indiana Township Association. Retrieved 2011-10-10. 1 2 "Duties". United Township Association of Indiana. Retrieved 2011-01-06. ↑ "Indiana Transportation Map 2009–2010" (PDF). Indiana Department of Transportation. 2009. Archived (PDF) from the original on 15 December 2010. Retrieved 2010-12-16. 1 2 "State of Indiana 2011 Rail System Map" (PDF). Indiana Department of Transportation. 2011. Archived (PDF) from the original on 15 June 2011. Retrieved 2011-06-19. ↑ Baker, Ronald L.; Carmony, Marvin (1975). Indiana Place Names. Bloomington, Indiana: Indiana University Press. p. 1. ↑ Goodrich, De Witt Clinton; Tuttle, Charles Richard (1875). An Illustrated History of the State of Indiana. Indianapolis: R. S. Peale and Company. pp. 549–550. ↑ Snow 1907, p. 83. ↑ Williamson, Samuel H. (April 2010). Seven Ways to Compute the Relative Value of a U.S. Dollar Amount, 1774 to present. MeasuringWorth. Calculations made using Nominal GDP Per Capita, a measure of capital intensivity, using "the 'average' per-person output of the economy in the prices of the current year." This is a measure of the amount of capital and volume of labor required to reproduce the work over varying production methods, but assuming that money represents a proportion of the economy. ↑ Counts, Will; Jon Dilts (1991). The 92 Magnificent Indiana Courthouses. Bloomington, Indiana: Indiana University Press. pp. 8–9. ISBN 978-0-253-33638-5. 1 2 "Population, Housing Units, Area, and Density: 2010 - County". United States Census Bureau. Retrieved 2015-07-10. 1 2 "Monthly Averages for Decatur, Indiana". The Weather Channel. Retrieved 2011-01-27. ↑ "Köppen Climate Classification for the Conterminous United States". Idaho State Climate Services. Retrieved 2011-01-23. ↑ Peel, M. C.; Finlayson, B. L.; McMahon, T. A. (2007). "Updated world map of the Köppen-Geiger climate classification" (PDF). Copernicus Publications. p. 1636. Retrieved 2011-01-23. ↑ "U.S. Route 27". Highway Explorer. Retrieved 2011-10-12. ↑ "U.S. Route 33". Highway Explorer. Retrieved 2011-10-12. ↑ "U.S. Route 224". Highway Explorer. Retrieved 2011-10-12. ↑ "State Road 124". Highway Explorer. Retrieved 2011-10-12. ↑ "State Road 101". Highway Explorer. Retrieved 2011-10-12. ↑ "State Road 116". Highway Explorer. Retrieved 2011-10-12. ↑ "State Road 218". Highway Explorer. Retrieved 2011-10-12. 1 2 Indiana Code. "Title 36, Article 2, Section 3". Government of Indiana. Archived from the original on 5 October 2008. Retrieved 2008-09-16. 1 2 3 4 Indiana Code. "Title 2, Article 10, Section 2" (PDF). Government of Indiana. Archived (PDF) from the original on 29 October 2008. Retrieved 2008-09-16. ↑ State of Indiana Department of Local Government Finance. "2010 Budget Order (Adams County, Indiana)" (PDF). Archived (PDF) from the original on 17 September 2010. Retrieved 2010-09-19. ↑ "Government". United Township Association of Indiana. Retrieved 2011-01-06. ↑ "Indiana Senate Districts". State of Indiana. Archived from the original on 15 January 2011. Retrieved 2011-01-23. ↑ "Indiana House Districts". State of Indiana. Archived from the original on 15 January 2011. Retrieved 2011-01-23. ↑ "U.S. Decennial Census". United States Census Bureau. Archived from the original on May 11, 2015. Retrieved July 10, 2014. ↑ "Historical Census Browser". University of Virginia Library. Retrieved July 10, 2014. ↑ "Population of Counties by Decennial Census: 1900 to 1990". United States Census Bureau. Retrieved July 10, 2014. ↑ "Census 2000 PHC-T-4. Ranking Tables for Counties: 1990 and 2000" (PDF). United States Census Bureau. Retrieved July 10, 2014. ↑ "DP02 SELECTED SOCIAL CHARACTERISTICS IN THE UNITED STATES – 2006-2010 American Community Survey 5-Year Estimates". United States Census Bureau. Retrieved 2015-07-10. ↑ "DP03 SELECTED ECONOMIC CHARACTERISTICS – 2006-2010 American Community Survey 5-Year Estimates". United States Census Bureau. Retrieved 2015-07-10. ↑ "DOE Compass". Indiana Department of Education. Retrieved 2011-10-10. ↑ "Richard R. Schrock - Autobiography". Nobelprize.org. Retrieved 2011-10-11. ↑ "Overview for David Anspaugh". Turner Classic Movies. Retrieved 2011-10-11. ↑ "David Smith chronology". David Smith Estate. Retrieved 2011-10-11. Snow, J. F. (1907). Snow's History of Adams County Indiana. Indianapolis: B. F. Bowen and Company. Tyndall, John W.; Lesh, O. E., eds. (1918). Standard History of Adams and Wells Counties Indiana. 1. Chicago and New York: The Lewis Publishing Company. Tyndall, John W.; Lesh, O. E., eds. (1918). Standard History of Adams and Wells Counties Indiana. 2. Chicago and New York: The Lewis Publishing Company.